The nation is sliding into a complete chaos. This is the time when we actually don’t know what kind of government runs the country, except the fact that Prime Minister Sheikh Hasina is the head of government. The Awami League government started with the 14-party coalition only to switch to an ‘all-party’ government to run the election. The continuous violence across the country rocked the whole land of the country. The armed forces indiscriminate shooting, the ruling party thugs attack on the procession of the opposition put the country in a dire situation. The opposition called blockade to the whole country to protest the unilateral announcement of election schedule ignoring the opposition demand for a neutral and non-partisan government to oversee the next general elections. The blockade program led to widespread violence all over the country leaving dozens of people killed and manifesting new forms of agitation like setting fire to the election offices, throwing petrol bomb at trains and uprooting the railway lines. The current political agitations may just vanish with one single move of the Prime Minister Sheikh Hasina. Instead of asking repeatedly the main opposition BNP to name members of cabinet and join the poll, the PM should resign to create an ambiance conducive enough to holding a fair and credible election. There is no doubt that the legality of the government, as well as the Parliament, has been challenged through a writ petition in the High Court though the Prime Minister insisting on that President Abdul Hamid had advised her to lead the election-time interim Cabinet. Though the ruling party claims that that it has done everything for holding free, fair and credible national election and that no one should have any concerns in this regards, but the evidence shows contrary, everyone sees when the AL and its supporters were marching in processions to the party’s head office to collect election forms that gave a visual picture to viewers of the type of level playing ground that the BNP could expect in elections held under the Awami League. In that very day, there were processions in the city, of various sizes proceeding to the party office. Many of the AL leaders with their supporters sat in the middle of the road occupying the street. The police was working overtime, holding traffic to let these processions go by, some in tens, some more, but all accorded the courtesy of free passage at the expense of the people on the road and their immense sufferings. After all, the processions were of those belonging to the ruling party and therefore deserved the courtesy, the sufferings of the people notwithstanding! The day of elections or in the days leading to it, the armed forces, that would no doubt play a very critical role in whether the playing ground is level or otherwise, would no doubt give this courtesy to the ruling party and the people would have to watch and wonder where the level field the CEC promised in his address had vanished. The present crisis is the lone creation of the CEC who can otherwise wait and act to see the parties to reach a compromise. But by acting on political line of the ruling party he has rather pushed the country to violence and people believe that all responsibility of deaths of common people and destruction of public and private properties will now squarely lie on him. The EC should now be central stage, and showing off its independence from the government – but the announcement of the date of the election on 5 January, in effect at least two weeks before an election needed to be held (24 January 2014 is when the new government should be sworn in, so the election has to take place at least a few days before then), appears to suggest that the date was picked by the government rather than the election commission. The address to the nation was not the end of the CEC’s predicament, which cannot be one that he is relishing. In the heat of the moment or to use a better expression, the height of disappointment, few considered the relevant facts about the CEC’s address. His address was billed as an address to the nation and the ambiance surrounding it had all that usually goes with an address by the President or the Prime Minister. The official BTV carried it and all private TV channels also carried the address live, courtesy the BTV. He was in fact given the same respect and importance that is reserved for the President and the Prime Minister. His post is a constitutional one. But he is not an elected representative and the warrant of precedence does not place him in the company of the President and the Prime Minister and the privilege to address the nation like these two top elected leaders of the country. The CEC’s action, described as farcical by many political observers to facilitate the ruling party politics to hold a stage- managed election to bring the government back to power, has thus prompted BNP and its allies to impose the nationwide blockade. To further destabilize the situation the government has lodged cases against several thousands more, while about half a dozen senior BNP leaders are languishing behind bars while the CEC has taken the new move to implement the government plan to hold a farcical election. The EC is entrusted to hold the national election, not a party election or work for a party to bring it back to power. But the EC’s decision has proved that he has abandoned the need for the participation of the major opposition without which he knows better than others that the election will not be acceptable to any quarters. Moreover, it appears that he is not bothered also if at least 25 other registered political parties are not taking part in the election while only four parties from the 14-party coalition are moving ahead to hold the farcical polls and the EC is acting accordingly. CEC Rokibuddin Ahmed has claimed that the EC and he as an individual have already proved its neutrality by holding local elections and City Corporations election. So there is no reason why BNP and other opposition parties should not trust in him. Is not he aware that even 30 thousand elections are not equivalent to the election of a Member of Parliament? The ruling party AL does not depend on any body’s advice or learn lessons from their past mistakes. The ruling coterie does not feel the necessity of discussions with the opposition parties about any national and international problems and they cannot tolerate any criticism by the opposition parties. Often the ruling party does not realize whether there is any opposition party in the country at all. 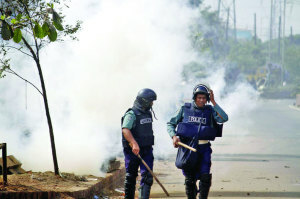 The authoritarian nature of the current government and the unrest risks plunging Bangladesh into a cycle of violence. It’s high time that the conflicting parties make some concessions for the greater interest of the nation and its people.